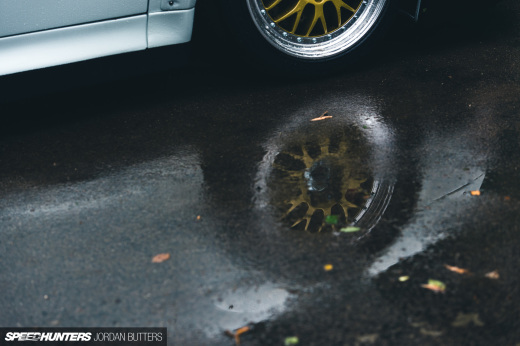 When we are talking about Porsche there are some major tuners worth noting. One of those companies is Techart, who have been around since 1987. In 2001 they started with a new concept called the GTstreet with the 997 GT2 being newest addition to this stable. 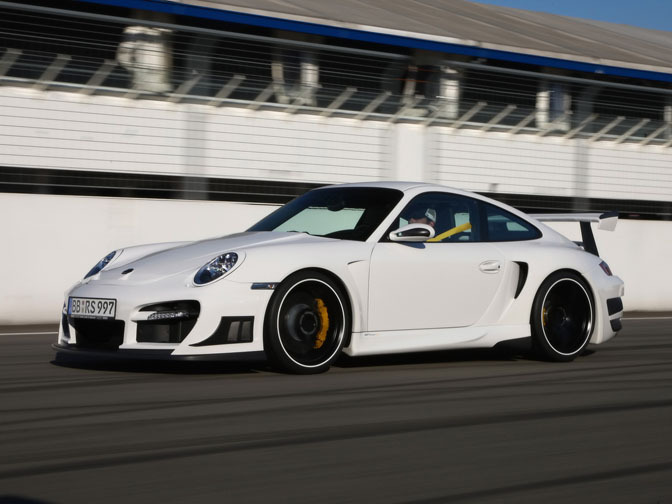 Techart has changed the look of the car and more importantly they added more than 160hp to its already impressive engine. Techart says its good, who am I to argue? In the above photo, you can see how the air flows over the car; looks pretty impressive. The complete body kit consists of nine parts including frontbumper, new bonnet and the huge rear spoiler. I have seen tuners use the wind tunnel before, like Voltex and Sunline; these types of companies are making a real effort in the R&D department. The only downside is that the aero parts are very expensive because of this, but on the other hand wouldn’t you want to buy parts that actually work? The design of the front bumper works very well and makes it look very aggressive. Inside the bumper there are multiple air ducts to direct the air through the radiators. The carbon air extractor you see on the side of the bumper is there to assist in directing the air and it also increases the downforce generated. Other parts like the hood, headlight covers and mirror covers are all made by Techart. Maybe you’ve noticed that the rear air duct has changed from the original, Techart replaced it with a new steel item to direct more cool air to the engine. This will probably be the side you will see the most when it’s not parked. How aggressive do you want it? Man does this look good. The GT spoiler is the most noticeable and is entirely made from carbon. It’s not just a spoiler to create downforce, because there are also air ducts in the lower part of it to direct air to the engine (not visible in this picture). The rear bumper features air ducts to pull air to the larger Tech Art intercoolers. The engine has 691hp with a maximum torque of 860 Nm. This has been achieved thanks to larger turbo’s, reworked manifold, new exhaust system, new intercooler and a reprogrammed ECU. 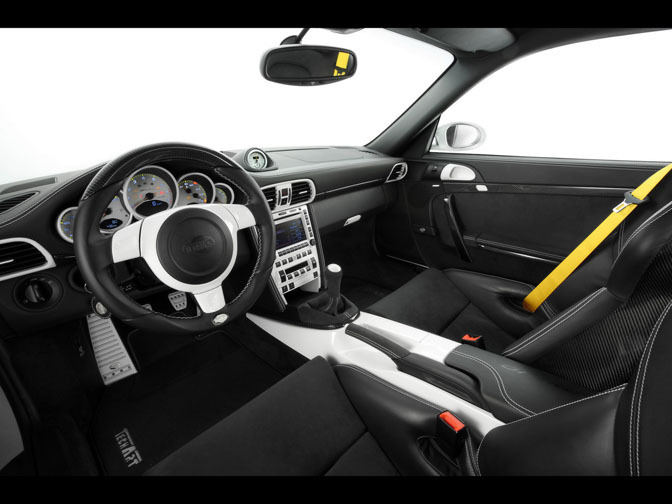 The office; Techart has several interior styling kits available but they also offer the customer a chance to choose whatever they want in their car. It ranges from a different color stitching to ostrich leather in every color thinkable. If that’s the case then I’d definably throw out the steering wheel which to me, doesn’t look right in such a nice interior. In the background you can see the grandstands surrounding Hockenheim. The car already had its shakedown on this circuit and it managed a time of 1:06.811. For a street car that’s incredibly quick. If you want something similar expect to transfer 350.000 euro to Techart’s bank account! I love me some 997. WOW this thing is amazing! Like a modern RAUH WELT car if it was satin black! A thought I had when you mentioned Voltex and Sunline in the wind tunnels. They're spending so much on R&D that works yet they get their designs ripped off here in the states. I wonder if this happens to companies like Techart too. it happens to any and all companies no matter what industry you are in. if you make a product that is popular you are more than likely going to find someone that will make a copy or something similar for cheaper. thats just how it goes. This plagiarism that everyone complains about happens on all shores. Hell, when i went to art center other students from newer batches were copying my art work. even famous names like Boyd and Foose have taken designs from other companies and slightly tweaked them or just offered them in a different bolt/size/offset that wasn't offered by the original manufacturer but its still excepted and praised by most american car builders. ok, i have finally found my dream car! @Section09 - Techart is situated in a higher market so it's not worth for companies to copy bodykits made for Porsches and such. I know for a fact that there was a campaign against copying a few years back in Germany. You should not complain about expensive cars, were I am it costs 350000 $ for a new BMW M5 and a new GTR will be the same, oposed to the 80000 ish usa price? This is the prise for living in Norway!